NEW ORLEANS – The collegiate track & field season is nearing its end as next weekend’s conclusion to the NCAA Division I Outdoor Track & Field Championships will close the book on what has been an exciting six months in the sport. 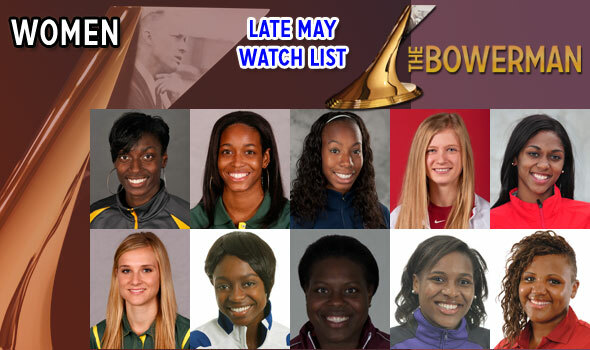 The final watch list for The Bowerman – collegiate track & field’s biggest honor – has been released, and Kansas’ Diamond Dixon has been added to the group of ten athletes to keep attention to as the season draws to the end. In addition, Oregon’s English Gardner returns to the watch list for the second time this season. Dixon, a sophomore, won the NCAA indoor crown in the 400 meters in March and has the second-fastest outdoor time (51.09) among the collegiate ranks this year. Dixon claimed Big 12 titles both indoors and out in the event this season and helped Kansas to 4×400 relay crown in both league meets. The Jayhawks’ relay took third at the NCAA indoor meet and is ranked No. 1 for the outdoor season. Dixon is making her first-ever appearance on the watch list. Ten women’s semifinalists for The Bowerman will be announced on Tuesday, June 19 and three finalists will be announced on Friday, June 29. The winner of The Bowerman will be presented on December 19 in conjunction with the USTFCCCA Convention in Orlando, Fla. The three finalists will be invited to take part in the award ceremony. Tia Brooks RS JR Oklahoma Throws Grand Rapids, Mich.
English Gardner (P) SO Oregon Sprints Voorhees, N.J.
Christina Manning SR Ohio State Sprints/Hurdles Waldorf, Md. Jeneva McCall SR Southern Illinois Throws Dolton, Ill.
Brittany Borman SR Oklahoma Throws Festus, Mo. Tori Bowie SR Southern Miss Jumps/Sprints Sandhill, Miss. Kamaria Brown FR Texas A&M Sprints Baton Rouge, La. Dezerea Bryant FR Clemson Sprints Milwaukee, Wis.
Emma Coburn SR Colorado Distance Crested Butte, Colo.
Octavious Freeman FR UCF Sprints Lake Wales, Fla.
Jordan Hasay JR Oregon Distance Arroyo Grande, Calif.
Ryann Krais SR Kansas State Combined Events Eagleville, Pa.
Sheila Reid SR Villanova Distance Newmarket, Ont. Abigail Schaffer SR Moravian Pole Vault Easton, Pa.
Ashley Spencer FR Illinois Sprints/Hurdles Indianapolis, Ind. Vashti Thomas RS JR Academy of Art Hurdles/Jumps San Jose, Calif.
Lucy Van Dalen SR Stony Brook Distance Wanganui, N.Z. Florida State’s Ngoni Makusha and Texas A&M’s Jessica Beard are the reigning winners of The Bowerman, which is named for legendary Oregon track & field and cross country coach Bill Bowerman.